If plans for a third runway go ahead at Heathrow the entire village of Sipson could disappear off the map by 2020. At least 700 homes would be demolished, according to the British Airports Authority's estimation, but campaigners claim while some 1,600 people would have to be evicted thousands more would be affected by a rise in air and noise pollution. There are stirrings of a quiet revolution in the small village of Sipson on the outskirts of Heathrow. There is talk of residents, who have fought airport expansion for years, joining forces with direct action groups for Swampy-style protests to fight plans for a third runway at Heathrow. "I've got nothing to lose. I have tried the political process," says Christine Shilling, of the No Third Runway Action Group (NoTRAG). The mother-of-two is no revolutionary but the former secondary school teacher and ex-educational psychologist feels so strongly she can see the time when such action might be necessary. Contact has already been made with direct action groups, she says. "If they go ahead and decimate a community in one of the most densely populated parts of the country, what will they do next?" Residents are determined to fight to save their village, which, according to local historian Philip Sherwood, has been on this site in Middlesex for nearly 1,000 years and has a name dating back to Anglo-Saxon times. The 77-year-old is so incensed that it may be destroyed that he said he would be prepared to lie down on the runway to stop it operating. 2006 could be the year in which Sipson's future is finally decided as the government's review of its 2003 Aviation White Paper is due by the end of the year. Campaigners fear not only the homes, shops, pubs and school in Sipson will vanish but that neighbouring areas, such as Harlington and Harmondsworth, will also become uninhabitable. Already planes are clearly visible every few minutes, low in the skyline above the rooftops of Sipson. Bryan Sobey sits in his living room, with triple glazing on the windows, in the home he has shared with his wife Ann since 1959. He pores over four options outlined in the latest draft proposals for Heathrow's possible future expansion in a glossy BAA brochure. If the runway goes ahead, Terminal Six will be where his front room now is, says the president of the Harmondsworth and Sipson Residents' Association. "This is ethnic cleansing without the guns," says the 76-year-old. He predicts as many as 1,600 people will be evicted from their homes. After 20 years of campaigning, the former customs officer says his stubborn streak will not let him give up the fight. "It's the principle that we're fighting for. "This is a vibrant community and the proposal is to obliterate it." His wife of 55 years, Ann, adds: "People don't realise the trauma this is causing. "People don't know what they are going to do. They don't know where their children are going to go to school." With an estimated 175,000 extra flights a year and 20 million more road movements, Mr Sobey said residents far from Sipson faced more noise and air pollution. As for direct action, he says: ""I'm too old to go climbing up a crane, but some people will." His neighbour Linda McCutcheon has lived in Sipson for nearly 40 years. She worries direct action might alienate people. As a member of NoTRAG, originally formed from local residents groups, she said she was just an "ordinary housewife" who wanted to help save her community. 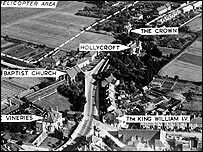 "There's the church I got married in, the cottage hospital where I had my children, the primary school and the playgroup I helped set up. All of it will be under concrete." Having always lived in Hillingdon borough, and with her 82-year-old mother living across the road, the prospect of moving is unbearable. "It's a very demoralising situation to think a community is going to be wiped off the map." Mrs McCutcheon, 60, and her husband do not want to move but she wonders who would want to buy their house, despite BAA offering transferable bonds guaranteeing its value at 2002 prices. However vociferous their campaign, not everyone shares their views. Labour peer Lord Soley, of Future Heathrow, which campaigns for the airport's development, fears if the airport does not expand it will lose out to its European counterparts, having already been overtaken by Frankfurt, Amsterdam and Paris. "The threat to Heathrow is real, not imagined," he says. If it is not a hub airport this would have serious long-term consequences for Britain and particularly the Heathrow region, with 70,000 people working at the airport and an estimated 100,000 other jobs indirectly dependent on the airport. The former west London MP said: "I have always lived under the flight path. If you asked me if I wanted it for my personal life I would say no, close it down tomorrow morning. He believes compensation should be fair but believes the case for a third runway is strong, warning of "dire consequences" if it does not go ahead. He cited the example of the East End docks, thriving in the 1960s, yet closed down by the 1980s. "Heathrow is already losing out in this race to be the premier airport," he says. Hillingdon council has long opposed the third runway on environmental grounds. Deputy leader David Simmonds says: "If you look at European rules of what air quality is required in residential areas a large part of the south of the borough would be uninhabitable." He is not convinced projected figures for increased air travel will materialise. Last year the airport handled nearly 68 million passengers and with three runways it could handle 116 million passengers by 2030, according to Department of Transport figures. "It is not as if Heathrow is going to disappear," he says. John Stewart, of the Heathrow residents group Hacan Clear Skies, says: "One old lady said to me she would be close enough to give the pilots breakfast when they land. "There should be a clear decision that enough is enough at Heathrow." The prospect of another runway was raised again in Gordon Brown's pre-Budget Report last year which stressed Heathrow's "unique role in supporting economic growth across the country". This summer, BAA is due to publish another version of its master plan about possible future development. And by the end of the year the government is to give a progress report on the White Paper, which supported a third runway if strict environmental conditions could be met. "There will only be a third runway if environmental problems are solved, chiefly air quality," says David Stewart, Department of Transport spokesman. BAA says it will await the outcome of the government consultation on the white paper. "Economically a third runway is desirable but we have to recognise the huge environmental impact," says a BAA spokeswoman. Mr Stewart, of Hacan, said: "Many have given their lives to the airport, believe in the airport but now in their retirement find the airport want to take their communities, their homes and their links with their families and friends."